It’s Joakim Noah’s basketball world now, and all the rest of us can do anymore is be witnesses. Noah led the Bulls with 21 points, 16 rebounds and four blocks, his team leading 16th double-double and 12th consecutive game with double figure rebounds. And Noah again enjoyed beating a 76ers team, against whom he had the best statistical game of his career last year with 23 points, 21 rebounds and 11 blocks in no small measure because of the local Santa Claus booing fans’ joy and cheering when he was badly injured in Philadelphia in the 2012 playoffs. Noah combined with D.J. Augustin on a pair or slick pick and rolls for a layup and dunk in the middle of a 13-0 second quarter run that broke open the game and led to a 51-31 Bulls halftime lead. Noah then began the early celebration in the third quarter as the Bulls went up 34, signaling an and-1 to the crowd on a diving score off a Jimmy Butler pass and then again waving the crowd on with a fast break dunk on a pass from Butler. Noah capped that run with a full court pass to Butler for a slam dunk off a Carlos Boozer steal and then Noah was off into the night. Yes, it’s only a few miles to Rush Street with 36 hours until the next practice; it’s dark and he’s wearing a stocking cap and sun glasses. Joakim enjoys life wherever he finds it. And it’s been a joy to watch Noah as the Bulls begin to straighten themselves out from the season long turmoil and disappointment with their seventh win in the last nine games to improve their record to 19-20. It’s a plan of sorts. The Bulls did reportedly make yet another trade earlier in the day with reports, confirmed by the man to be traded that once the NBA offices open for business again Tuesday point guard Marquis Teague will be traded to the Brooklyn Nets for Tornike Shengelia, a D-League power forward from Georgia. But this sort of thing doesn’t phase anyone in the Bulls locker room anymore after the injury loss of Derrick Rose and trade of Luol Deng. The Bulls just continue to move on and again threaten .500. Which Thibodeau said he hopes (and plans) the Bulls get to soon to assure Noah that spot on the Eastern Conference All-Star roster. 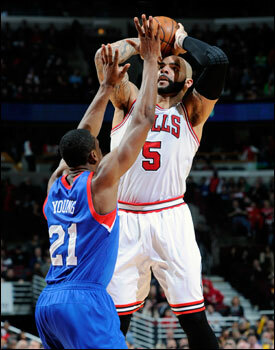 Boozer had his 12th double-double with 15 points and 13 rebounds. It was a relief and a welcome respite for the Bulls, who without their top two scores generally engage in these taffy pull games of relentless defense for hour and hour until someone can figure out how to make a shot at a crucial time in the last moments. Not this night, even if the Bulls had to be wary. The 76ers are in a precipitous fall at 13-27. But they weren’t even expected to win that many games when the Bulls played them early in the season. The Bulls opened up a 20-point lead and then collapsed and lost with rookie Michael Carter-Williams scorching them for 26 points and 10 assists. The Bulls practically delivered him the Rookie of the Year award. Kirk Hinrich and Butler took it back Saturday. They harassed and badgered Carter-Williams everywhere. He finished with 10 points on five of 22 shooting and looked like he preferred to hide in a Syracuse snowstorm. Even his coach felt badly for him. 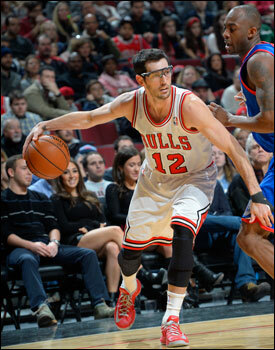 Hinrich had six points, six assists and seven rebounds with the defensive heavy lifting against Carter-Williams. Augustin was terrific once again, leading the team in assists for the 11th time in the last 18 games despite playing off the bench with 19 points and eight assists. And Augustin continued to give the Bulls offense and shooting, making two of four threes. He’s nine of 18 the last three games. For his part, Augustin seems to feel as if he may finally have found a home after stops in Charlotte, Indiana and Toronto. “I’m pretty happy,” said Augustin. “I’m just trying to stay focused and keep working and hopefully we can go to the playoffs and keep building and once you are there anything can happen. There seemed a question whether this Bulls team, really whether anyone could after the injuries, the disappointment, the displacement, the uncertainty. It’s not that the Bulls always play well or that they have enough to beat the top teams or many of them in the NBA. But they’ve continued to compete at a high level, and they’re getting a series of relentless performances from Noah and their usual contribution of tough play. Boozer had his 12th double-double with 15 points and 13 rebounds while rookie Tony Snell continued to impress with 13 points and made three of seven three pointers. His confidence in shooting has begun to give the Bulls better court spacing to open the inside for Boozer, Noah and Taj Gibson. Snell and Augustin off the bench hit five of the Bulls six three pointers as Thibodeau has begun to work them in with groups of starters to mix up the lineups to add more shooting without losing too much defense. This time Hinrich and Augustin played together more an Nazr Mohammed even came in with a pair of blocks and a dunk, which Noah could only give a four. “A very solid four,” Noah corrected. It was a rare, lighthearted evening for the Bulls, who now are just 12-8 at home. But they have won five of their last six at home as well. The Bulls tied with Washington for fifth as the league hits the halfway point this week and remain just a game and a half out of third in the Eastern Conference. The Bulls were threatened just a bit Saturday as the 76ers led 6-2 with the Bulls missing their first six shots with a turnover. But starting with a Boozer jumper four minutes in the Bulls converted four of their next five shots to lead 24-19 after the first quarter. Augustin’s playmaking with seven second quarter assists and Noah’s finishing sent the Bulls to that 20-point halftime lead and no let down this time. Thaddeus Young led the 76ers with 12 points as they were two of 19 on threes. 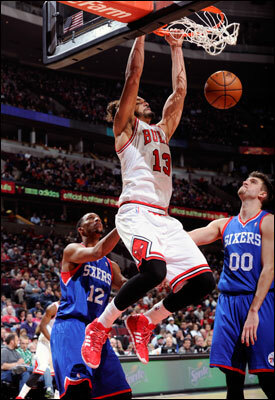 The Bulls, meanwhile, had 27 assists on 40 baskets and a season best 25 fast break points with Noah leading the way.